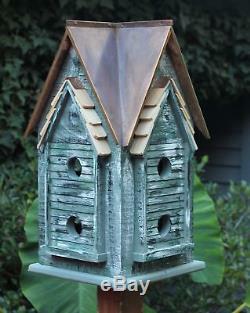 Heartwood Copper Mansion 27 in x 15 in x 15 Purple Martin House. Clean outs, ventilation and drainage built in. Hand crafted in the USA. Lift off roof for easy cleaning. Holds up to 8 families. Place in a spot with afternoon shade. Product Type: Purple Martin House. Country of Manufacture: United States. Overall Height - Top to Bottom: 27. Overall Width - Side to Side: 15. Overall Depth - Front to Back: 15. Overall Product Weight: 30 lbs. The item "Heartwood Copper Mansion 27 in x 15 in x 15 Purple Martin House" is in sale since Friday, February 17, 2017.